The Flying Saucer was inaugurated in 1978, as a one-stop shop in Sharjah with a café and restaurant, newsstand, gift shop and drugstore. Courtesy of gb agency, Paris and Sharjah Art Foundation Collection. The Flying Saucer was inaugurated in 1978, as a one-stop shop in Sharjah with a café and restaurant, newsstand, gift shop and drugstore. Though short-lived, the building later became a grocery store then fast food restaurant. It is an architectural landmark; the futuristic circular structure is capped with a dome and has a fully glazed façade with V-shaped leaning pillars, offering a panoramic interior. The building conjures many memories for generations who grew up in Sharjah. The building became one of Sharjah Art Foundation’s permanent venues in 2015. Currently undergoing conservation, the parking area will transform into an open public space, suitable for events and displaying artworks. In addition to the conservation a basement level extension will accommodate various functions, including a café, library and a space to hold meetings, workshops and different events. The exhibition space on the ground level will be inaugurated in the upcoming Sharjah Biennial 14: Leaving the Echo Chamber. 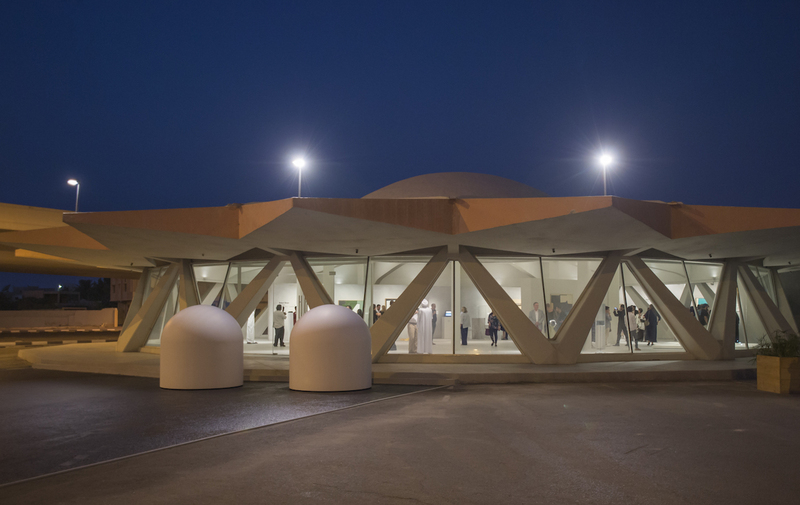 For more information about Sharjah Art Foundation venues, please click here.